DURHAM: Randy Mason, 28, passed away unexpectedly after a wreck in Durham on November 7, 2018. He was born in Durham to the late Danny Kevin Mason and Sheila Kaye Edwards Mason. In addition to his parents, he was also predeceased by his grandfather, Mutt Edwards. Randy was employed with Bull City Radiator for 11 years. 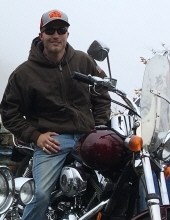 He had a passion for working hard and riding motorcycles. He loved his family and will be missed by all who knew him. Randy is survived by his grandmother, Mae Edwards; girlfriend, Stephanie Skinner; sons, Danny Alton Mason, Aaron Wayne Mason; brothers, Kevin Brad Mason, Shane Mason, Daniel Holsonbeck; uncles, Wayne Mason, Dalton Mason, Johnny Mason, Randy White Mason, Drew Edwards, Eddy Edwards, Terry Edwards, Kent Edwards; niece, Kylee Mason; and nephew, Cameron Hunt. The family will receive friends from 6 to 8 p.m. on Monday, November 12th at Clements Funeral Home in Durham. A funeral service will be held at 1 p.m. on Tuesday, November 13th at Clements Funeral Chapel in Durham with Pastor Paul Williams officiating. Burial will follow in Maplewood Cemetery. In lieu of flowers, please consider donating in memorial of his children, Danny and Aaron. Please mail contributions to Bull City Radiator: 4918 US 70 West, Durham, NC 27705. To send flowers or a remembrance gift to the family of Randy Mason, please visit our Tribute Store. "Email Address" would like to share the life celebration of Randy Mason. Click on the "link" to go to share a favorite memory or leave a condolence message for the family.